verso Castel di Pietra, luogo di memoria dantesca dove sembra che finì tragicamente di vivere Pia de’ Tolomei. One starts from the Castellaccia hamlet: a few houses and a refreshment stand. One cycles on the provincial road S.P. 27 in the direction of Ribolla. After 2.2 kilometres one skirts the quarry and afterwards at the first crossing (2.7) one turns left leaving the provincial road and taking the village rural road “Castel di Pietra”. The road continues straight on for 2 kilometres parallel to the river Bruna (on the left) and across tilled fields. Arriving at a dangerous bend to the left (4.7) one cycles straight on and on dirt track. Almost at once past a tributary stream of the river Bruna one continues uphill as far as a building belonging to a large farm (5.4). Leaving the building one cycles on downhill along a tree fringed alley for about 1 kilometre reaching a crossroads on the left near a solitary cypress and a large boulder (6.4). 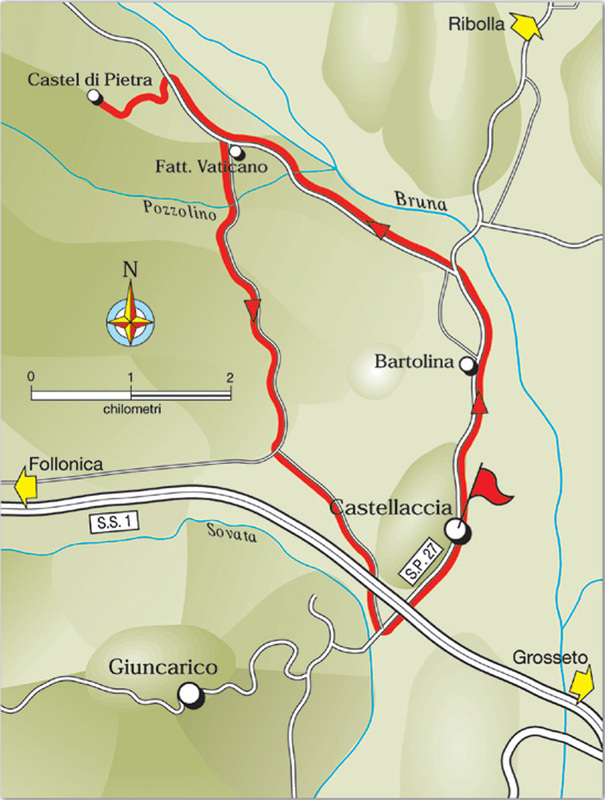 Here one turns left on a hairpin bend starting then uphill towards the Serratona Farm and the rise of Castel di Pietra reaching a wooden enclosure with a signpost, drawing the attention to and informing about the archaeological diggings of Castel di Pietra (7.1), that are easily reached on foot. 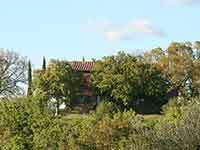 The cycling itinerary continues with the return to the rural buildings “Castel di Pietra” with the Vaticano Farm (8.7). Here one takes a dirt path on the right leading downhill and fringed with a double row of young cypresses. Past the stream Pozzolino (9.3) at once by a well- defined crossing one continues straight onto a tarred road. From now on the road winds with gentle ups and downs across tilled fields, pastures and farms. One avoids all the possible deviations keeping on the main track on the tarred road. Before reaching the freeway S.S.1 Aurelia (heavy traffic and four lanes) the byroad turns left (12.5) and runs parallel to the freeway. After 2 kilometres one cycles under the Aurelia (14.5) to reach, after 200 metres, a T-crossing: one turns left and takes the S.P. 27 that carries anew under the S.S. 1 Aurelia. 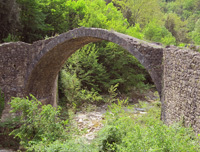 After a few hundred meters one meets another crossing (15.4) where one turns left in the direction of Ribolla as far as the Castellaccia hamlet where the ring closes (16.5).